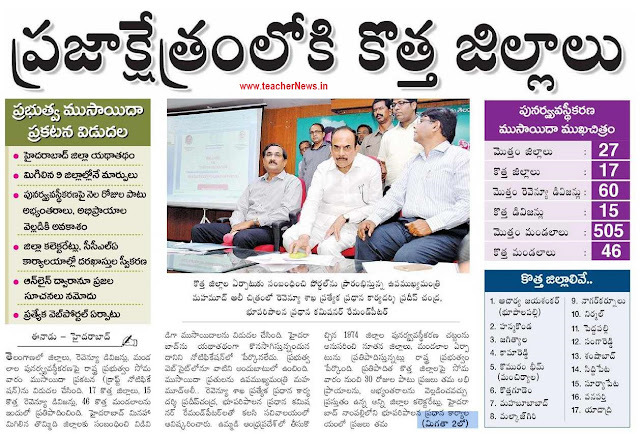 Telangana New Districts Formation GOs 361, 362,363, 364, 365, 365, 366, 367, 368 and 369. Re-Organization of new Districts, Revenue Divisions and Mandals in Telangana State. New District Names, New Divisions Names and New Mandal Names. TS Latest District Formation details. District Administration – Formation/Re-Organization of new Districts, Revenue Divisions and Mandals in Adilabad, Karimnagar , Warangal , Khammam, Nalgonda , Mahabubnagar, Ranga Reddy, Nizamabad and Medak Districts – Preliminary Notification - Orders – Issued. 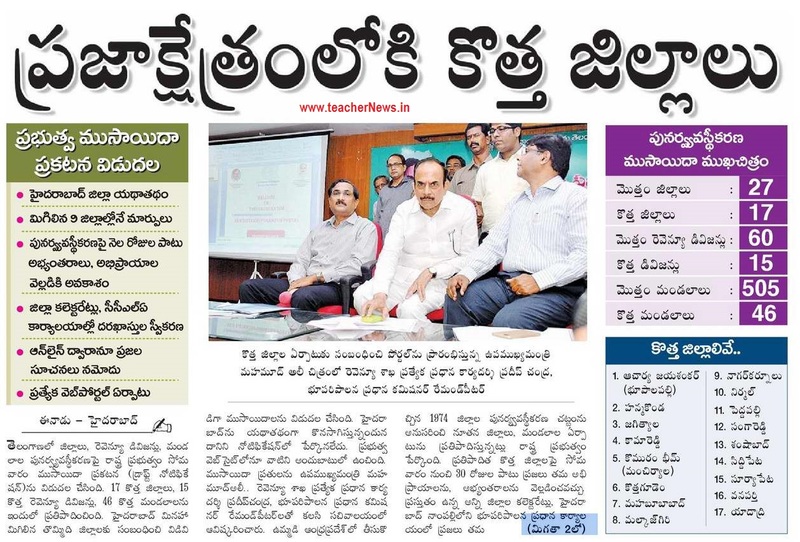 Objections / Suggestions on New Districts Formation Link at newdistrictsformation.telangana.gov.in. Government of Telangana, Revenue (DA-CMRF) Department G.O.Rt.No. 361 to 369 Dated: 22th, August 2016, District Administration – Formation/Re-Organization of new Districts, Revenue Divisions and Mandals in Telangana State – Preliminary Notification - Orders – Issued. 1) Telangana Districts (Formation) Act 1974, (Act 7 of 1974). 2) From the SPL.CS &amp; CCLA, Telangana, Hyderabad, Lr.No.Coord/350/2015 dated 21.08.2016. 1) The appended notification shall be published in Extra-Ordinary issue of Telangana Gazette, dated 22-08-2016. The Commissioner of Printing Stationery and Stores Purchase, Telangana State, Hyderabad is requested to furnish 100 copies of the Gazette notification for the use of the Government. 2) All District Collectors, Adilabad, Karimnagar , Warangal , Khammam, Nalgonda , Mahabubnagar, Ranga Reddy, Nizamabad and Medak Districts is requested to publish the preliminary notification in English and Telugu in the District Gazette for information of the public and give wide publicity in all concerned areas. Under sub-section (5) of Section 3 of the Telangana District (Formation) Act, 1974 (Act 7 of 1974), notice is hereby given to all the concerned, that the Government in the interest of better administration and development of the areas concerned proposes to form of new Districts, Revenue Divisions and Mandals in the present District of Adilabad District in the State of Telangana, as detailed in Schedule I and Schedule II here to appended. Objections or suggestions are invited on the above proposal from all persons residing within the District/Revenue Division/Mandal/or Village are being taken into consideration by the Government. All objections or suggestions should be in writing in English or in Telugu or Urdu and should be addressed to the Collector (by designation) within whose jurisdiction the area lies, so as to reach the office of the Collector on or before the expiry of thirty (30) days from the date of notification.